What is the right footwork for a tennis player? How to move well on the tennis court? I will try to answer these questions in order to help you to improve your tennis game. Tennis movements are very various and there are many different ways to move on a tennis court. Tennis is a complex activity that involves movements in every direction in order to get to the balls but also to recover. The best tennis players are the ones using a right technique in their movements but also the ones that are able to do this very quickly. First of all a tennis player needs to execute a split step before every shot. This split step is done while the opponent hits the ball. It is a very small and short hop that allows you to be on the ball of your feet in a wide stance. The player will then be ready to move in any direction. This is the basis to have a good footwork. A split step has to be done before every single shot and allows the player to be light on his feet and to be ready to move to the ball. A tennis player rarely does more than 4 steps to go to the ball. It is then very important to be explosive and quick on the first steps. Depending or where the ball is going to bounce the player will have to move in a different way. Being able to read the shot of your opponent is a key in order to move well. If the ball is going to bounce next to you usually one side step is enough to be in the right positions. If the ball is deep you will have to move back very quick in order to hit the ball while you are moving forward. If you are late you will still be off balance while you are hitting and then the shot will not be efficient. For most of the shots the player will have to move around 3 steps to the backhand or forehand side. The most efficient way is to move forward and in diagonal to the ball. After the split test, step forward with the leading leg in the direction of the ball and at the same time push off the ground with the opposite foot. This will allow you to have an explosive and quick first step. Once the leading leg is back on the ground push off hard on the ground and bring your other leg in front of you, then set you up and you should be able to hit an efficient shot. If you have to run for a short ball, right after the split step explode forward an avoid doing a step back. This is a common mistake that costs time. Your first step has to be forward in the direction of the ball. Moving to the ball is one thing but now you need to recover well in order to be ready for the next shot. The most efficient way after a shot is to do a cross over step and then to side step back This is a lot quicker and more efficient than doing only side steps to recover. All those different steps need a good coordination and of course they need to be practiced. A lot of tennis players could be a lot better if they were using a correct technique while they move to the ball and recover. The best way to train movements is agility training on the court. Moving to a cone, doing a shadow and recovering at the starting point are good drills to improve the movements. 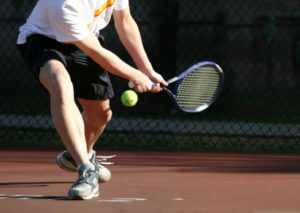 Because there is no tennis balls involved the player can really focus on his movements and learn the right technique. After a little while he will not think about, it will be automatic and then he will be able to use this with live balls. Consistent fitness training for tennis will help to improve your movements technique and then your quickness on the court.